Mix Miracle Whip and mustard until well blended; spread onto bread slices. 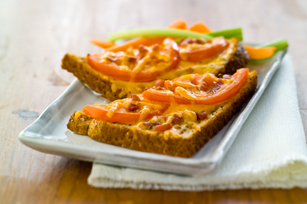 Top with cheese, tomatoes and bacon pieces. Broil 3 min. or until cheese is melted. Serve with carrot and celery sticks. Prepare using Kraft Mozza-Cheddar Light Shredded Cheese. Since this great-tasting sandwich is made with better-for-you products, it can be part of a healthful eating plan. And as a bonus, the cheese provides an excellent source of calcium.